This work, to date Kapustin's only composition for violin and piano, was written in 1992. Four bars of solo piano open the piece, and then the violin introduces us to the five-note motif that dominates the first movement, which is classically tripartite. The languid second movement is much freer in construction and the finale, whilst employing a jazz temperament, displays characteristics of a more classical style somewhat reminiscent of Prokofiev. It is built on three basic ideas: the first is introduced by the violin and is then juxtaposed with the second, a more lyrical theme again introduced by the violin and taken up by the piano. The third theme, which occurs throughout the work, is more robust and closer in spirit to the first. The whole Sonata is classical in structure and style, but it has the same sense of exuberance and continuous flow as most of Kapustin's other works. Listen below to Japanese violinist, Tatsuo Nishie perform the first movement, accompanied by Giuseppe Andaloro. 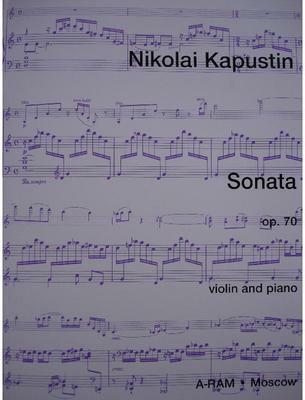 What do you want to know about Nikolai Kapustin: Violin Sonata op 70?